The halls (and email) are abuzz with anticipation in Brightcove’s Boston and Seattle offices as teams of engineers prepare for the start of today’s Brightcove Hackathon. While we can’t divulge the specific nature of the Hackathon, we can say that it’s a precursor to new developments that will be announced at our PLAY 2012 global customer conference later this month. In the interest of good, old-fashioned competition and innovation, engineers from across the company and country have formed teams dedicated to creating some unique and compelling projects that we’ll soon share. Challenged by Brightcove CTO Bob Mason to use their “vision and creativity to push the limits and define innovative new concepts,” the teams commenced hacking today at 2 PM ET / 11 AM PT, and have 24 hours to turn their concepts into reality. The final presentations take place June 8th at 2:30 PM ET, after which winners will be announced and glory will be had for a select few! 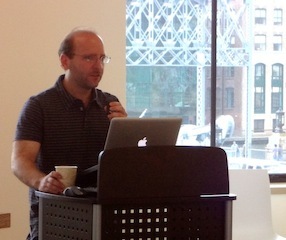 Brightcove software architect Todd Yard welcomes competitors to the Hackathon. The projects will be announced publicly and demonstrated for attendees at PLAY.